Wild Japanese E92 M3 The Japanese owner of this E92 isn’t really one to seek the spotlight. As you’ll see, he prefers to let his car do the talking. Words and photos: Chris Nicholls. Japan is famously a land of extreme contrasts: the ultramodern coexisting with traditions 1000s of years old; incredible subtlety and restraint coexisting with stuff that hits you over the head with a sledgehammer. It’s something you see in its people, too. On the surface, the Japanese will almost always be impeccably polite and humble, but get close and you’ll see they can be just as wild and out there as those from any other country, if not more so. Of course, this isn’t to say all Japanese people have this duality. Plenty are very much ‘as they come’ and don’t really change, no matter what the situation or how much alcohol they’ve imbibed, but even then, you can find that contrast finds a way to leak out somehow, even if it’s not via their interactions with other people. One of those ways is via their cars. Some of the quietest people there have some of the loudest cars, and vice versa, and the owner of this particular machine is no different. So shy and retiring that he actually declined being interviewed for this article, or even giving us his name (preferring to have the car’s builder, Ebihara Shinta from Feliz Auto Centre, answer all the questions instead), he nevertheless goes for drives and hangs out at shows with this rather stunning, and very eye-catching, E92 M3. Built over a period of about six months, with paintwork done by Ebihara-san’s friend Yamamoto-san at Panorama Craft, the car was designed to be as unique as possible. “He didn’t want to see many other cars with similar paint jobs around,” says Ebihara-san – and thanks to the combination of the custom beige paint, yellow accents, beautiful copper Neutrale TM13 wheels and custom camo wrap on the roof box, it definitely achieves that goal. The question that people always ask, though, is why? Why would someone so quiet go for a car so loud? According to Ebihara-san, he simply gets a kick out of it; “He loves it when people talk to him, think he’s very shy and retiring, then realise he owns this car. It blows their minds,” he says with a laugh. “It’s precisely because he doesn’t like standing out as a person that he likes his car to do so”. Fair enough. And very Japanese to boot. 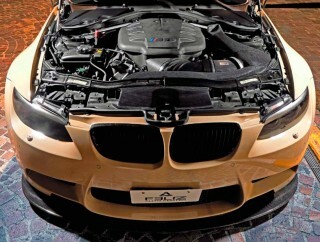 So how did this E92 end up looking like this anyway? After all, it’s a far cry from a stocker. “I actually used to own this car,” says Ebihara-san. “Two owners ago, and long before it had been resprayed in its current colour. I lowered it, put new wheels on it, fitted a new exhaust and manifold and so on, but that was about it". Rather amusingly, two owners on, and Ebihara-san’s recently- opened shop, Feliz Auto Centre, was given the opportunity to sell it on again, and when he was discussing the sale with the current owner, Ebihara-san says talk turned to modifying it once more: “We decided that if we were going to alter its looks, we might as well go hard and thus decided on the respray and new wheels.” As you can tell from the engine bay, the car was originally black, but with the current owner’s previous ear (an E90 M3 Saloon) also being black, both he and Ebihara-san thought a change was best. The wheels, while new to this machine, were actually carried over from the owner’s EJK), and the entire current look was predicated around matching those wheels. “To be perfectly honest, the owner himself didn’t really have a preference [in terms of colour]", says Ebihara-san. Having sorted the main paint colour, discussion then turned to the accents. According to Ebihara-san, that yellow you see on the mirrors, stickers, front roundel and Packline roof box logo was actually designed to match the six-pot front and four-pot rear Brembo calipers, which he originally fitted back when he first owned the car. However, he explains that the camo wrap on the roof box itself was actually inspired by a chance incident when building the car. “You know those paint protector mats you lay over the bodywork while you work on the engine? The Snap-On ones we happened to be using at the time were that sort of camo pattern, and we both agreed it matched the paint. So we decided to wrap the roof box a similar camo and it worked.” Further exterior mods came in the form of US market LCI rear lights, M Performance black kidney grilles, completely customised front lights with new indicator and light element designs, as well as custom LED angel eyes, and some subtle extra aggression via a Japanese- made Kohlenstoff carbon front lip and rear wing and 3D Design carbon diffuser. 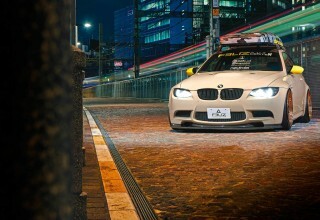 With the exterior aesthetics complete, Ebihara-san and his crew then turned their attention to the rest of the car. Given the custom exhaust system and manifold were still in good nick, there wasn’t any need to touch them, but a Gruppe M carbon intake certainly added to the car’s already impressive aural appeal and likely added a few horsepower to boot. Further shove came from a custom ECU remap, but given the car’s primary purpose as a show car and fun cruiser, nothing else was deemed necessary in terms of performance. As a show car, though, the stance needed to be just right, and that’s where Ebihara-san and his team spent much time getting things perfect. Back when he owned it, Ebihara-san had already lowered the car quite a lot on a set of KW V3s, and dialled in the stance via Assist rear camber and toe control arms, as well as customised front uprights, but the new owner wanted to go lower again, and that meant further tweaking of the setup, as well as fitting a fresh set of customised V3s. TÜV regulations mean KW does not offer that kind of customisation from the factory, so they were modified locally after purchase. With all that done, though, the car sits in a way you just don’t see with many cars this low – no ‘hovercraft camber’, no insane tuck, just usable, aggressive stance and plenty of tyre contact patch. Handy, given the E92’s already tail-happy reputation and this car’s mild power bump. Inside, given it’s more a cruiser than a touge assault vehicle, there haven’t really been many changes at all. You’ve got a set of alloy pedals, a Yupiteru radar detector, which also displays extra engine info like oil temps and the like, and a Shinto omamori, or good luck charm, which you can purchase from pretty much any shrine in Japan. These are available to help out in whatever area of life the buyer is interested in (anything from a safe pregnancy to good school results), so of course, in this instance, it’s designed to boost the owner’s luck when driving. Now the car is complete, though, talk inevitably turns to what the owner plans to do next. Ebihara-san says initially, the owner seemed happy to just keep the car as-is and enjoy driving it and shocking people at shows with the fact he owns it, but recently that thought process appears to have changed. “He’s now talking about swapping it for an E30 M3, which he wants to tune every aspect of,” he says with a laugh. Having owned an E30 M3 himself, Ebihara-san has already told the owner he’s in for quite a shock if he does decide to go down that route, given how much cars have changed since the E30’s debut, but that doesn’t seem to have deterred him at all. “We haven’t really got as far as deciding things in detail, but I get the feeling he’d like to build another unique car, like the E92 – a car you won’t find anywhere else. Once it’s built, I’m sure it’ll be quite interesting. He actually said he’d like to put a sequential in there, but given how serious that would make the build, I told him we’d have to take our time and do things properly”. Indeed. While there are other cars in Japan driving on the street with proper race sequentials, they’re obviously not suited to such use, so there’s a high chance it’ll end up more of a track build, but either way, we look forward to seeing how it goes. If it happens, it’ll be just another example of Japan’s extreme contrasts – going from a modern show car to a classic track car. No doubt the owner will be keen to see how people react to him owning that, too. GruppeM carbon intake has been fitted. Dazzling Neutrale TM13 20s. Yellow accents match the brake calipers Custom exhaust features a single tailpipe. Custom headlights. This M3 is seriously low and seriously unique.